Whenever we talk about diet, we inevitably get to the question of bread. Is it good for you? Bad for you? Will it make you fat? Will it help your workout? It’s controversial because many people CRAVE bread and get very panicky at the thought of not being able to eat it. Unless you’ve been living under a rock for the past 10 years you’ve probably heard the message that highly processed white bread doesn’t offer many health benefits. What surprises many people is that I don’t consider whole-wheat or multi-grain bread to be that much better. sugar swings too low, you can end up with severe sugar/bread cravings and hunger. 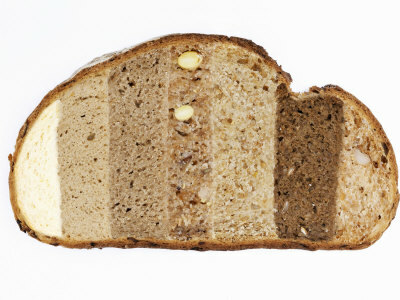 Does whole wheat bread offer more nutrition than white bread? In theory it should. Whole wheat bread uses every part of the wheat berry including the outer bran layer, the endosperm layer, and the germ portion. These three layers contain B vitamins, vitamin E, some antioxidants, complex carbohydrates, fiber, fats, and protein. However, when it is milled into flour several chemical processes take place. The fats in the wheat start to oxidize, and many of the nutrients are lost within 72 hours of milling. So unless you are buying the wheat yourself, sprouting it, milling it at home, and baking with it within three days of milling, you probably aren’t getting all the nutrition you think you are. Commercial bread factories combat this in white and wheat bread by adding synthetic forms of the nutrients lost to the flour after it is milled. This can be done in a powder form or a spray emulsion form. The spray form is “stabilized” by adding sugar to the mix (one of the reasons sugar shows up on your bread ingredient label). This same nutrient fortification process happens with pasta, cereal, and rice as well but with rice they actually shellac the rice after adding the nutrients by spraying it with an ethanol or isopropanol solution of zein, palmitic or stearic acid and abeitic acid. Article by Dr. Ilana Goldberg, D.C.